I know the above is really a metaphor, but I took it literally the other day. I now know WHY it works better as a metaphor. On a cool, cloudy afternoon I headed off to walk in the Holliday Nature Preserve in Westland, Michigan. 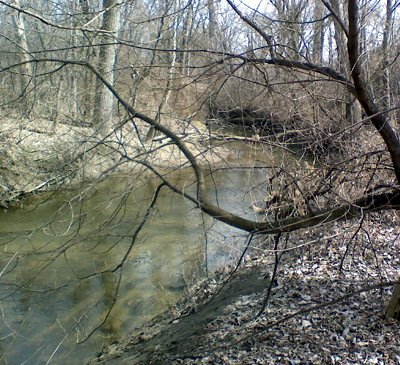 I’ve written of the Preserve before; it’s a 500+ acre wildlife and forest natural area that runs along the Middle Rouge and Tonquish Creek and is under the jurisdiction of Wayne County Parks. I took my dog Bella with me (I’ve written about her too in these pages). That was really a no-no for a couple of reasons. One, it’s against Preserve rules and two, the route I wanted to take was not made for man or beast–especially a beast on leash. That’s because for this route was on a steep slope on the south side of the river between Farmington and Wayne roads. I chose the more difficult route because an old-timer told me he had found arrowheads and pottery on the slopes of a sandy hill somewhere near here. In addition, I’ve heard a story that tribes of the Three Fires Confederacy–the Ottawa, Ojibwa and Potawatomi–used to meet near here to trade and talk. I have also heard talk that when the Holliday Park Townhouses were built near this site a generation ago, ruins of a village or encampment were found, but kept quiet so as not to slow construction. So with winter gone and the ground still free of spring vegetation I figured might find that hill and stumble across something of historical value there too. So Bella and I walked. Or should I say we clambered over and under and around fallen trees on the side of a very steep incline with a fence at the top and the cold river below. The trees that littered the ground were the remains of Ash trees that had been killed by the Emerald Ash Borer that has decimated this species in much of Michigan. 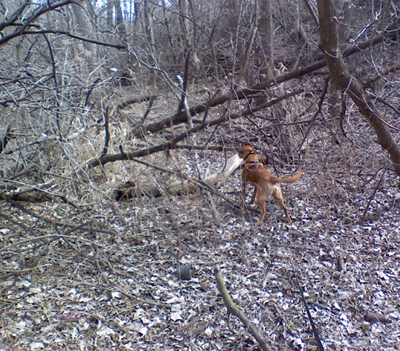 And of course, having a dog on a retractable leash was not pleasant as we were not of the same mind in which route to take and many times during the 90-minute walk I had to reverse course so that dog, leash and I were not separated by lumber. At one point as we neared the end of our adventure, Bella tensed and stared ahead at full alert. I figured she saw, smelled or heard something. As we slowly moved forward,three white-tail deer scampered away, much to Bella’s delight. Only the leash kept her from joining them. We eventually made it back to the car. No injuries but no Indian artifacts either. Part of the problem is that dead leaves still cover the hillside. They not only made walking difficult, but covered the ground so thoroughly, even an axehead couldn’t have been seen, even if such an item had been there. So I may do the walk again after a heavy spring rain washes the leaves away. And this time, I will do it the easy and the legal way: sans dog.